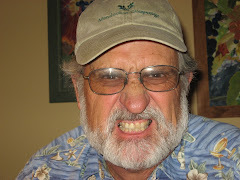 The Grumpy Winemaker: Buy Washington Wine or Else! After 30 years in the Washington wine industry, I think it is time from some of us old timers to speak up. I will try to be enlightening and philosophical, but I might be somewhat grumpy at times. There will be current as well as historical perspectives on the Washington Wine Industry. The views expressed here do not reflect the views of Bonair Winery, Inc. For those views, talk to Shirley, my wife. Buy Washington Wine or Else! My dire prediction is that if the people of Washington don't start buying Washington wine, the industry will be the shadow of its former self in three years. Only one bottle in six sold in the state was made in the state. (The Washington Wine Commission is feebly working on that this month, but I haven't seen a surge in sales.) Wineries are going broke, many are for sale, and some just don't have anything to sell, so they will just quietly go away. Mike Lempriere somewhat follows the history of the Washington wine industry and here is his list of defunct wineries in the state http://www.vintners.net/wawine/misc/defunct.html. I'm sure the list is not up to date since Mike is a busy guy, but it shows you that owning and operating a winery is not an easy business. Okay, so the wine industry was oversold here in Washington; as well as California and probably Oregon - not sure who drinks all that expensive Pinot Noir. Everyone wanted to be the next Leonetti or Quilceda Creek. The wine market has become a lot more realistic in the past year and I'm sure those two wineries are doing fine, but the wanabees who priced their first ever, over-oaked, VA-coated, oxidized Cab at $50 a bottle because Parker just doesn't bother with reasonably-priced wines, are sucking gas. Their friends still have that $600 case in their cellar, hoping like you said, it will get better because it can't get any worse. They aren't buying any more. Many wineries will just go away. After all, they have a few hundred cases in inventory, a bunch of amateur winemaking equipment, and a garage or rented ministorage unit. Others, like E.B. Foote with a long history, will try to sell. Olsen Estates with little history is for sale for $3.4 million which includes a nice new building in the Prosser Autopark. Even with Paul Gregutt's new book, Walla Walla is fading away. The first question people ask at the Yakima Valley Visitors center is, "How much farther is it to Walla Walla?' When told it is another two and a half hours, most opt for staying in Yakima and visiting the Rattlesnake Hills. Sure, Walla Walla is pretty and quaint, but the AVA is nothing to write home about. It is far eclipsed as a serious growing area by the Horse Heaven Hills, Rattlesnake Hills, Wahluke Slope, and Red Mountain. The generic Columbia Valley produces most of the grapes in the state, and fine grapes they are. Yellow Hawk is for sale. Canoe Ridge and Sagelands are up for grabs - look for those listings real soon. Right now, the number of new wineries in the state pretty much equals the number of wineries shutting their doors, keeping the number around 700 - give or take 50 wineries on any given day. A winemaker friend was just told by his agent that the new $9.99 wine in Seattle is now $6.99 or $3.50 a bottle to the winery. It's hard to make any money at $42 per case - especially if you are buying grapes at WAWGG price or above. I mean, you can bring out the Jesus Machine, but for only about a 10% addition. It was a miracle back in Canaan and it still works, but not enough of a miracle to sell wine at those prices. So, I implore all you bloggers (bloggers conference people) to buy Washington wine. Help save the industry! You could do something positive for a change. In 1979 I moved to Washington and planted a vineyard near Zillah, WA. My wife and I own Bonair Winery. I wrote the petition to establish the Rattlesnake Hills AVA.